ng homes partners with Nourish Scotland to talk about food!! OVER the past year ng homes has partnered with Nourish Scotland to look at some of the wider issues around Food in the Community. 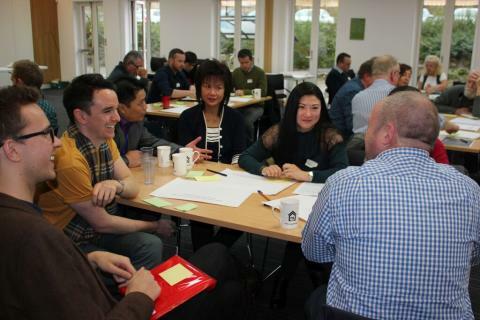 The first community event was held in March and was attended by residents, members of voluntary and public organisations where they discussed and identified some action areas ranging from accessibility, affordability, food growing, healthy food and issues surrounding food supply. The follow-up event was held in Saracen House, Possilpark earlier this month and had a focus on the topical issue of ‘The Future of Scottish Farming’. Around 35 people attended the event including residents, education, Poverty Alliance, community organisations and farmers. There was a real energy around the room as people participated in groups to discuss issues such as ‘Who is Farming for’ and ‘Who benefits from Farming’ and people could see connections to their community. Pete Ritchie, Nourish Scotland Director, said: “We welcome the opportunity from the Scottish Government to start a national conversation around farming in Scotland. We hope that as a result of this process, measures will be put in place to work in balance with the land, communities, our health, climate, soils and sustainable local economies”. Mr Lu showed his gratitude by providing a range of Chinese cooked food enjoyed by the participants. Regeneration Manager for ng homes Margaret Layden on 0141 560 6000.